Of course, it’s the “decay” that’s the tough part. If you believe in the transformation of life, then getting through the days and moments of nursing someone with a terminal illness will no doubt be easier. At the very least, you can cling to the faith that as a primary care-giver, you’re easing your loved one through and past the pain and suffering of their final journey. What a privilege and responsibility this is. What trust your loved one places in you, literally putting their life into your hands during their final transformation. But when you’re so fatigued with the daily tasks of care-giving, the relentless tiring days and sleep deprived nights, it’s so very easy to lose sight of the privilege–the very gift you bestow but also receive from this labor of love. When Roger was first diagnosed with Pancreatic cancer, I couldn’t believe that any God could inflict this on me. I didn’t think I was capable, strong enough, to survive nursing my soul-mate through the decay, through the transformation from this life to whatever lies beyond. Eventually, I realized this was my purpose: there was no place on earth I would rather have been than with my husband during the years and months of his illness. This was the “growth” part of Walter White’s equation in my own life. For I couldn’t nurse Roger through the final years/months/days of his life and not grow emotionally and spiritually. The very act of care-giving is a selfless act but one in which you’ll have the opportunity to lessen the suffering of a loved one, while growing in your own compassion and humanity. It’s a time in life when you will truly understand the meaning and the act of love. ‹ What could you say to a dying person that would not enrage by its triviality? 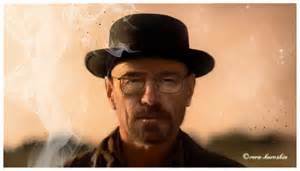 I know this may be a controversial stance but I want Walter White to live and get away with it! Thx for sharing!